Get things back to normal tomorrow, until then - I took this last week, love the contrast - nature does it so much better than we ever could! Hope everything has settled down for you and we see more of Taunton before Spring gets here! I'd say from the looks of those "Croak-I" (that IS the plural of crocus, right?) it looks like it's HERE! Nice snap! Thank you for this colourful photo! still snowing, after two months our crocus will dare to come . Good weekend to you and yours! Before I read your narrative, I thought, "What beautiful contrast!" 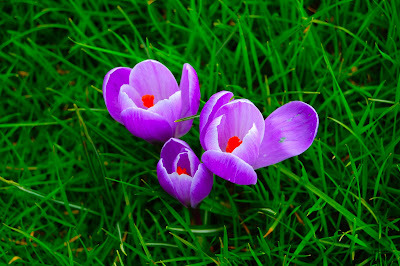 There is a delicacy about crocuses that I adore. Or, it is croci? !